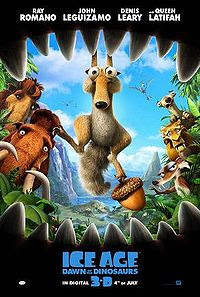 Ice Age: Dawn of the Dinosaurs, also known as Ice Age 3 , is a 2009 3-D computer animated film. It is the third installment of the Ice Age series. It was announced and approved by Fox president Hutch Parker on January 30, 2007. It was initially slated for a December 12, 2008 release, but the scheduled release date was moved to July 1, 2009. A sneak preview was shown in selected theaters on Father's Day in the United States. The film was produced by Blue Sky Studios and features the voices of Ray Romano, John Leguizamo,Denis Leary, Queen Latifah, Seann William Scott, Josh Peck, Simon Pegg, and Chris Wedge, and the film is distributed by 20th Century Fox.